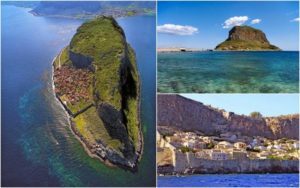 Tour the sites and museums at your own pace and then spent some time walking around the beautiful town of Nafplion before returning to Athens. Such a private tour is advisable for people that do not like to be confined to a preset schedule or travel with a large group of people. 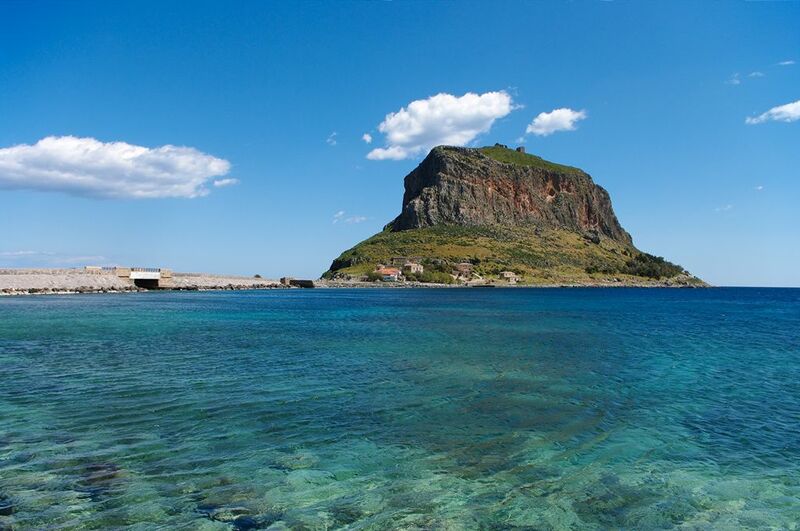 We start from your lodging in Athens, arrive after one hour at Corinth Canal and cross to the island of King Pelops. the peninsula of Peloponissos. Arriving in the ancient city of Corinth, we explore an ancient city that several empires fought over throughout the centuries. Continue to Mycenae, a mighty kingdom of ancient Greece, leader of the Greek city states during the Trojan war, according to Homer “a city of gold”. You will walk in through the Lions’ Gate, see the Cyclopean walls, the remains of Agamemnon’s Royal Palace, the Beehive Tombs, and the Treasury of Atreus before arriving in the romantic Venetian town of Nafplion, one of the most beautiful cities in Greece, Have lunch in a traditional taverna in the charming old town and after lunch we proceed to Epidaurus to visit the ancient theatre and view the Sanctuary of Asclepius, the God of Medicine, whose snake-entwined staff (caduces) remains the symbol of medicine to this day. Transportation of 1-4 passengers = 260.00 €. 5-8 passengers the extra cost is 10.00 € per person. b) a local professional tour guide, can be arranged to meet you in Mycenae at the extra cost. The region of Argolis is one of the longest occupied regions in Greece, with evidence of Neolithic settlements. 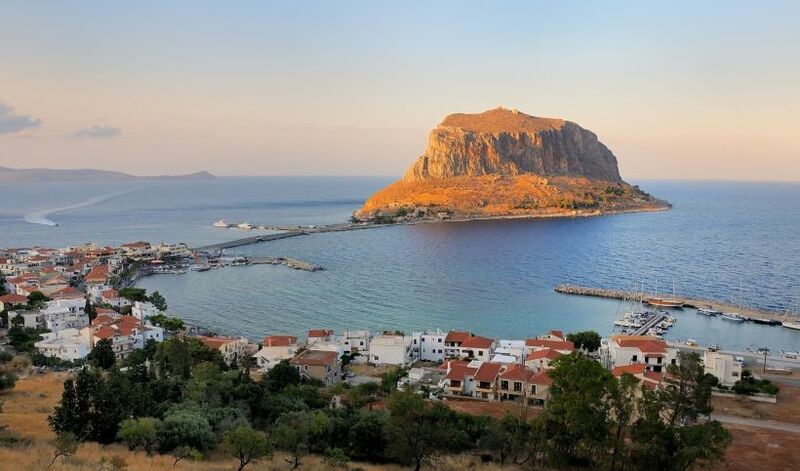 It’s no surprise that Mycenae, mentioned in Homer’s Iliad, today is an essential stop to every Greece trip. Attractions such as Agamemnon’s fortress with the hilltop acropolis and Agamemnon’s Palace, the famous Lions’ Gate, the royal cemetery, site of one of the most lavish archaeological hauls in history, the Treasury of Atreus, the sanctuary of the god of medicine with the amazing theatre of Epidaurus, and the elegant city of Nafplion, draw huge crowds of people. These are the reasons that the tour to Argolis is a popular one day tour. PRICES: All travel agents, in Greece and worldwide, offer the same tour at different prices. We are sure that our discounted prices are not matched. After 60 years organizing tours throughout Greece we have secured the best deals in all aspects of travel. 2) The Student Enabler price, (ISI card holders), without lunch and without entrance fees = 49.00 €. – We offer you the best price in the market. We can assure you that you ‘ll have a memorable tour. – Juniors under 19 and E.U. students, are free of charge. – Lunch (3 course menu) is served in a restaurant in modern Mycenae village and costs 10.00 € extra for everybody. – Entrance fees to Mycenae and Epidaurus sites andmuseums. – The services of the professional tour guide all along the tour. The canal of Corinth – the mythical fortified city of Mycenae with the Lions’ Gate, the palace of Agamemnon and the tomb of Atreus – The Epidaurus, with the sanctuary of Asclepius(the god of medicine), and the famous for its amazing acoustics theatre of Epidaurus & a short photo stop at the romantic and beautiful “Venetian” old town of Nafplion. Mycenae was the kingdom of mythic Agamemnon. Myths related to history have inspired poets and writers over the centuries from Homer and the Greek tragedies of the classical period. The site was uncovered in 1874 by Heinrich Schlieman, who also found and excavated the site of Troy. You enter the citadel through the famous Lions’ Gate. The priests of the sanctuary of god Asclepius were excellent surgeons. Today, next to the sanctuary of Asclepius, there is a small museum, displaying the instruments and tools used by the priests to perform even brain operations. The administration of the sanctuary decided to build a theatre on the ground of the sanctuary, to entertain the patients. 13:00 Lunch in a local restaurant Lunch is optional. See the price paid. After Nafplion we continue to EPIDAURUS and visit the ancient theatre. The UNESCO’S world heritage listed monument is the birthplace of Apollo’s son Asclepius, the healer, and was the most popular healing center of the classical world. Epidaurus is most famous for its theatre, one of the best preserved classical Greek buildings and still used today due to its amazing acoustics. Mycenae, the home of the Atreides royal family, is situated on a hill-top on the road leading to Corinth and Athens. 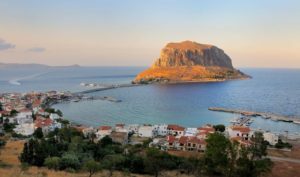 The site was inhabited since Neolithic times (about 4000 BC) but reached its peak during the Late Bronze Age (1350-1200 BC), giving its name to a civilization which spread throughout the Greek world. During that period, the acropolis (= highest point of a city) was surrounded by massive “cyclopean” walls which were built in three stages (1350, 1250 and 1225 BC). The outer fortifying walls, are large stones and must still look similar to 3500 years ago when they were built. We enter the citadel of Mycenae through the famous Lions’ Gate, because of the two lions above the entrance way, the first monumental sculpture in Europe (13th century BC). Immediately on to our right we come to Grave Circle A, a royal cemetery in which Schliemann found six shaft graves, 19 skeletons, and the incredibly rich burial furnishings which made his discovery one of the great archaeological finds of all time. This is where Schlieman found the ancient mask, which he called “the Mask of Agamemnon” but turned out to be the face of an unknown king from a period 300 years earlier. That mask is probably one of the most recognized ancient artifacts in the world and is still unofficially known as “the mask of Agamemnon”. The rest of the site is interesting if you know what you are looking at, so take the time to read the material available in guidebooks. A ramp and stairs lead up from the grave circle to the palace on the top of the hill; unfortunately little remains of the palace except for a Great Court and a megaron (a room with central hearth and inner columns). The view when you get to the top of the hill is spectacular. You are really commanding the valley all the way down to Argos and Nafplion. From here you can follow a path down the back of the site to the Postern Gate and the Secret Cistern, a pitch-dark tunnel leading down some 80 steps through the solid rock. We can then return to the Lion Gate around the north side of the hill. A second tholos near the grave of Atreus was excavated by Mrs. Schliemann and is called the Tomb of Klytemnestra; it is one of the latest and most finely constructed of the tholoi. The third one called the Tomb of Aegisthus. is much earlier and its roof has collapsed. Returning down the modern road about a km we come to the most famous tholos, the Tomb of Agamemnon; the half-columns, which decorated its doorway, are in the Mycenaean Room of the National Museum. Do not leave from the site without a visit to the museum of Mycenae. From the jewellery found in the graves some are displayed at the site’s museum and some in the Athens Archaeological Museum. In myth Mycenae was the home of Agamemnon, commander of the Greek army, which fought against Troy, and historically it was the most powerful Greek state during the last third of the Bronze Age (1600-1100 BC), which is why this period is called Mycenaean. Heinrich Schliemann excavated here in 1874-76 and found in Royal Grave Circle A the rich treasures which proves that Agamemnon really lived and that Homer’s story of the Trojan War was history, not myth. 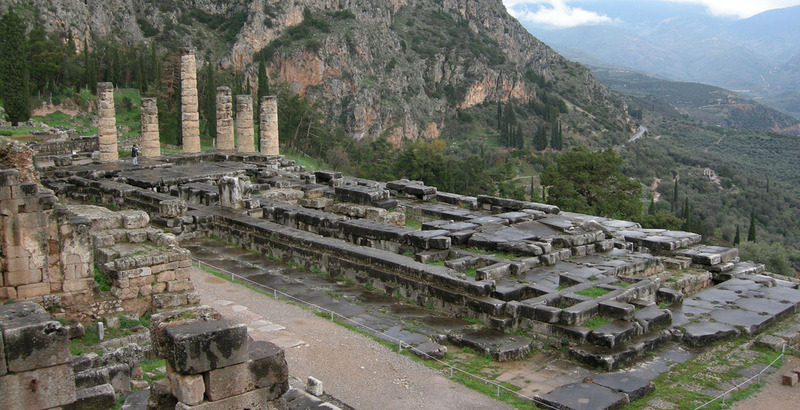 The myth of Mycenae is the story of the Pelopid dynasty. Pelops, who gave his name to the Peloponnese (=Island of Pelops), had two sons, Atreus and Thyestes. Atreus, being the older son, became king of Mycenae but later he punished his brother, who had an adulterous affair with Atreus’ wife Europe, by forcing him to eat his two sons for dinner. Atreus had two sons, Menelaus and Agamemnon, who married 2 sisters; Menelaus married Helen(the beautiful Helen of Troy) and Agamemnon married Klytemnestra. When Helen ran off with the Trojan prince Paris, Agamemnon and Menelaus became commanders-in-chief of the great expedition, which fought and won the Trojan War. When Agamemnon returned from the war, Klytemnestra was not overjoyed to see him; she had taken a lover (Thyestes’ son Aegisthus) and Agamemnon, who had earlier, at the beginning of Trojan war, sacrificed his daughter Iphigeneia so that favourable winds would blow his fleet to Troy, now drove up to the palace with his new concubine, the Trojan princess Kassandra. Klytemnestra therefore invited Agamemnon to come in and take a bath; she gave him a garment to put on (with no holes for his head and arms) and while he stood there with this bag on his head she killed him with three blows of an axe. Later Orestes, the exiled son of Agamemnon and Klytemnestra, returned to Mycenae and killed his mother to avenge his father; for his crime of matricide he was driven mad by the Furies (mythic emblems of guilt) until finally, in the Attic version, he was acquitted at the first Areopagus trial, under the Acropolis.